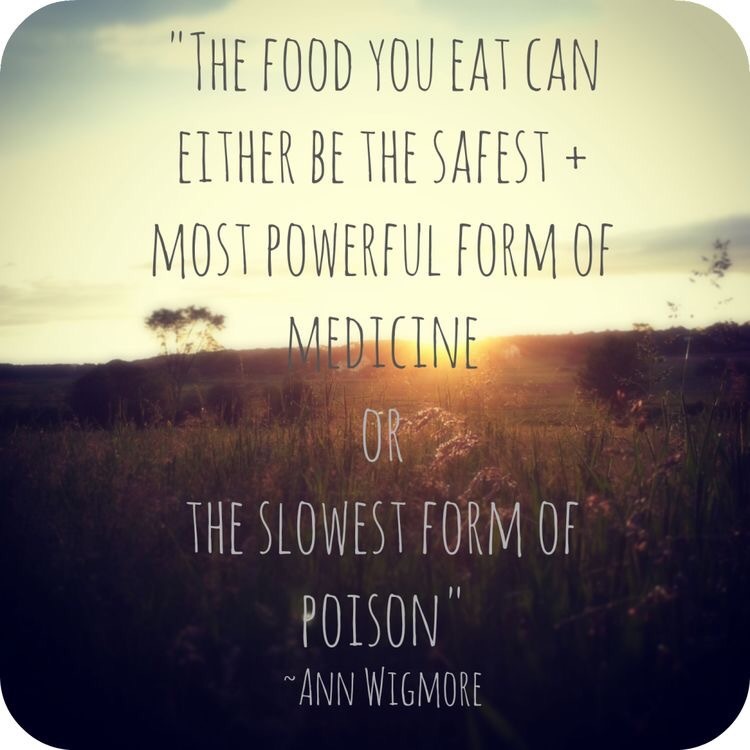 Sometimes I think we need a reminder that the food that we eat can be just as strong as the medications our physicians prescribe. Likewise, a daily habit of French fries or donuts (or chocolate and coffee, like me!) can cause disease. Which is where Logan and I are at – fighting illness with food (and in Logan’s case, allergy). This weekend, Logan was diagnosed with strep throat. A bummer because spring has finally sprung in the UP…. BUT I am grateful it happened this weekend instead of next weekend, because next weekend, Logan turns THREE! 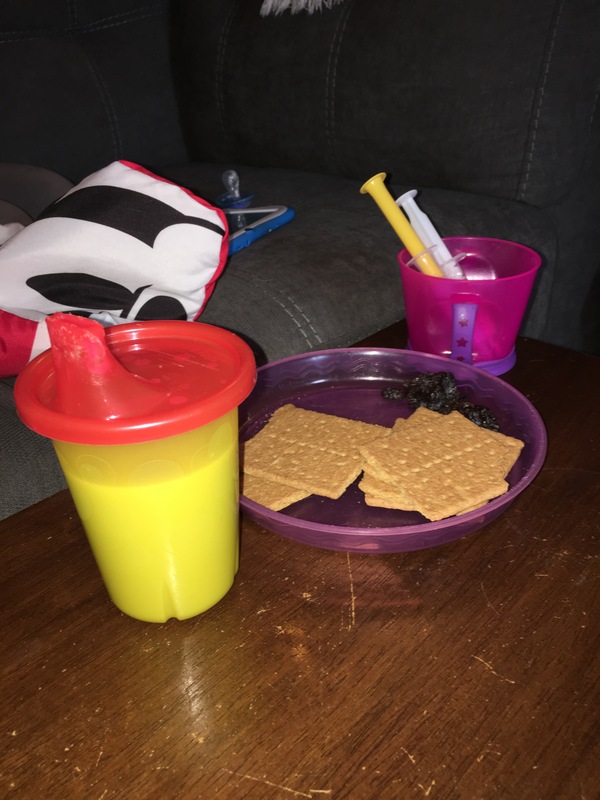 Needless to say, Logan’s dinner plate doesn’t look very appetizing… raisins, fruit snacks and graham crackers (all dairy free, soy free and peanut free, for the win!) Also pictured – his sippy cup of cashew milk and cup with syringes of antibiotic and antihistamine. We’re also supplementing with a probiotic – question for you all: do your littles give probiotics JUST with antibiotics or all of the time? As for me, I stayed home with Logan while Brad went out to dinner with the family for a birthday dinner. Since it was just me, I didn’t make anything elaborate for myself. Since I’m trying hard to follow an anti-inflammatory diet (but am not quite sure what I’m doing yet! ), I had half of a tuna sandwich on sprouted grain bread… I am not a fan of mayo so I mixed in some hummus. In addition, I had a green smoothie (ok, it turned out more brown)… I admit, I am probably the last person on the planet to drink green smoothies. However, I am NOT a lover of vegetables. 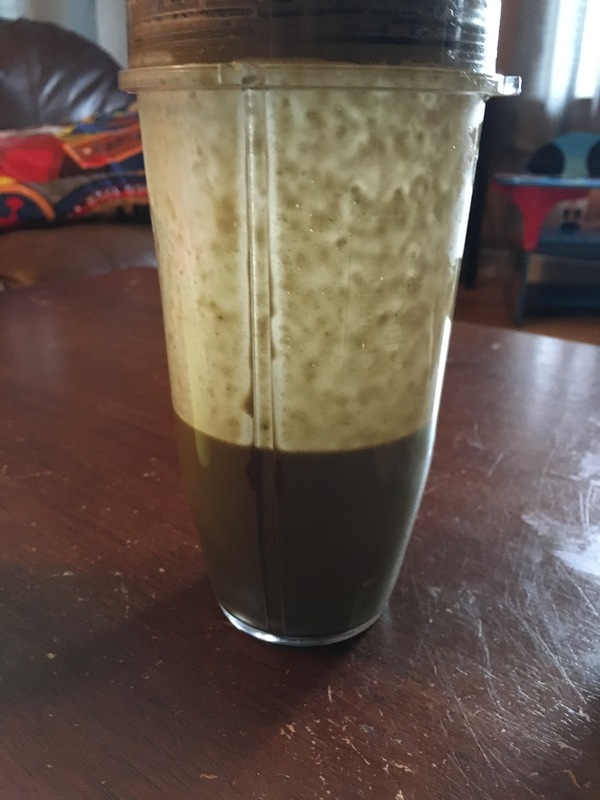 Putting spinach or kale in my smoothie freaked me out at first but then I realized – all of the ingredients mask the flavor of the ingredients! Yes… this smoothie looks unappetizing but it was delicious. I don’t follow any specific recipe since I stopped calorie counting but this little gem has roughly a cup of Silk Original Unsweetened Cashew Milk, a generous handful of kale, a spoonful of almond butter (MAYBE a tablespoon? ), a scoop of Vega chocolate protein powder, a handful of sliced frozen bananas (maybe half of a banana) and 6 drops of Trader Joe’s Organic Stevia drops. I don’t always use the stevia but sometimes I want a bit more sweetness. A word about protein powder… I really like to have it handy for smoothies if I’m wanting a certain taste. I find if I rely on it too much for meals, I am bound to overeat though. Any great smoothie recipes?? I need all the help I can get! 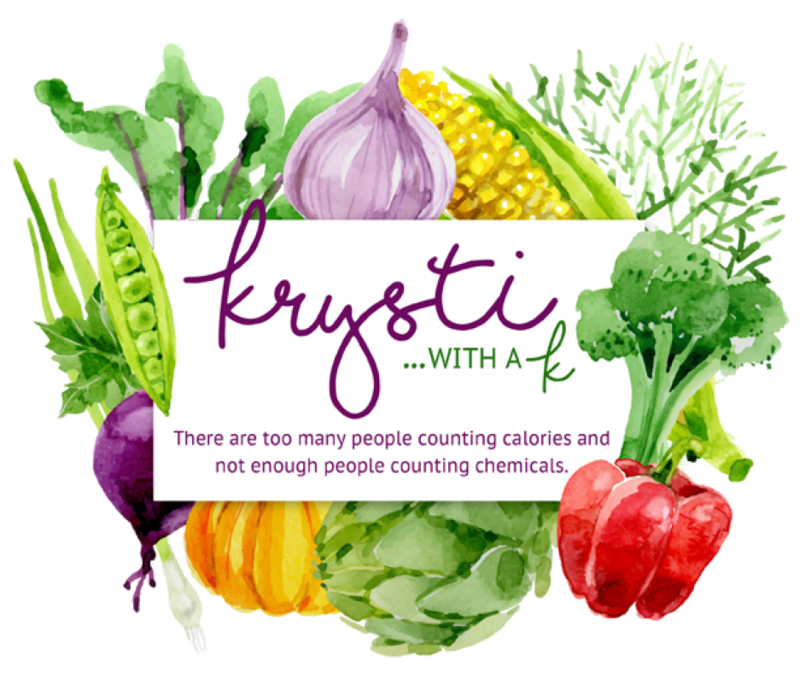 Hi, Krysti! Thanks for signing up to follow my blog and diet, exercise and living past 100. Obviously at your age you don’t have to worry about the longevity yet. It’s great to see you are living a live of health and health education. I am an old retired journalist, financial reporter, who didn’t get into writing about health till after I retired. So, I only have seven years of it. BTW, if you are interested in green smoothie recipes, search them on my blog. Lee Ann Savage, a Vita Mix demonstrator gave some great tips on doing them. Best of luck with your blogging!